Coronation Street spoilers indicate that things are about to shake up in Weatherfield once again. As a matter of fact, Clayton Hibbs (Callum Harrison) will soon return and yes, he will be delivering some major drama. Here’s what you need to know. 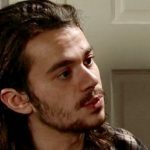 Coronation Street viewers can expect to see Clayton Hibbs return in episodes as early as next week. Shona Ramsey (Julia Goulding) will pay a visit to her son, who is currently behind bars. He will receive some shocking news about his father Dane. It’s without a doubt that Clayton’s return will send shockwaves for a lot of people involved. It will also cause new tensions for Shona and David in their relationship. Clayton is in jail for the murder of David’s wife Kylie. Clearly, he hasn’t changed his ways at all when he tries to involve his mother in his criminal activity. PREVIEW PICS: Shona faces a dilemma over Clayton, Gemma and Paul get themselves into a tricky situation, and who are the new owners of the Kabin? In the meantime, don’t forget that Coronation Street airs weeknights on the ITV network and is available on Britbox in the U.S. Let us know your thoughts by leaving us a line with your comments below. And as always, come back to Soap Opera Spy for all the latest news, updates and spoilers on Coronation Street and all of your favorite daytime television shows right here!